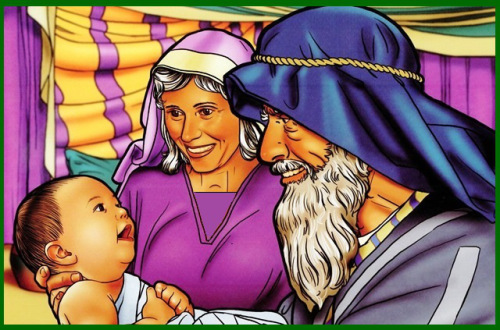 Abraham wanted Isaac to marry within the family. Abraham wanted to obey God in the who as well as in where that is why he didn’t want his son to go back. Make your obedience full and complete. Abraham’s servant asked God for guidance in this very important task. He (Eliezer) had learned much about faith and about God from his master. What are your family members, friends and associates learning about God from watching you? Be like Abraham setting examples of dependent faith. And be like Eliezer, asking God for guidance before any venture. Eliezer was simply asking God to show him a woman with an attitude of service- someone who would go beyond the expected common help of offering water to a weary traveler, but also to his animals. Rebekah had physical beauty, but the servant was looking for a sign of inner beauty. Appearance is important to us and we spend time and money improving it. But how much effort do we put into developing our inner beauty. Patience, kindness and joy are the beauty treatments that help us become truly lovely- on the inside. 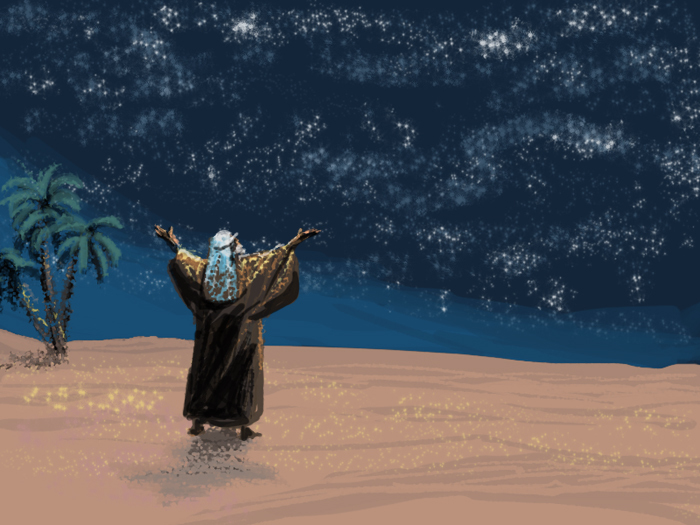 When Eliezer told his story to Laban, he spoke openly of God and his goodness often we do the opposite, afraid that we will be misunderstood or rejected or seen as too religious. Instead we should share openly what God is doing for us. Now Abraham was old, well advanced in years; and the LORD had blessed Abraham in all things. The LORD has greatly blessed my master, and he has become wealthy; he has given him flocks and herds, silver and gold, male and female slaves, camels and donkeys. 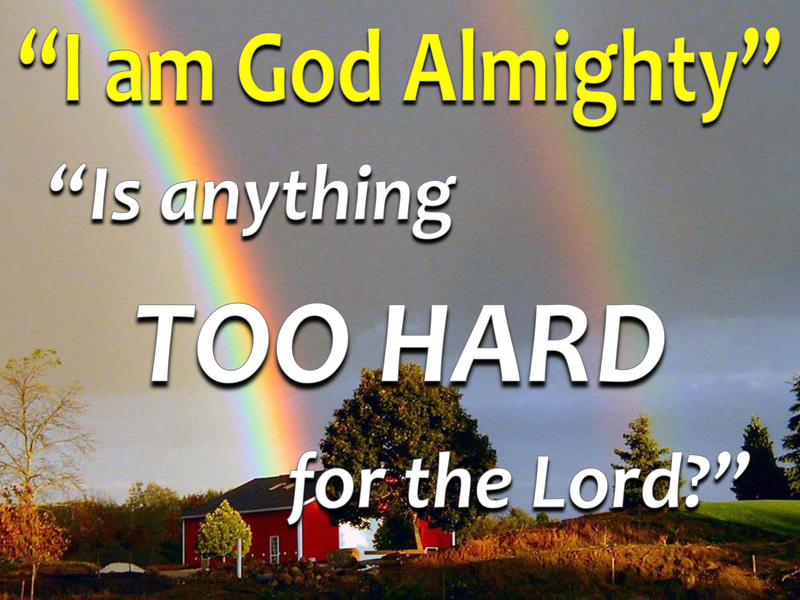 Then Laban and Bethuel answered, “The thing comes from the LORD; we cannot speak to you anything bad or good. 1 Now Abraham was old, well advanced in years; and the LORD had blessed Abraham in all things. 6 Abraham said to him, “See to it that you do not take my son back there. 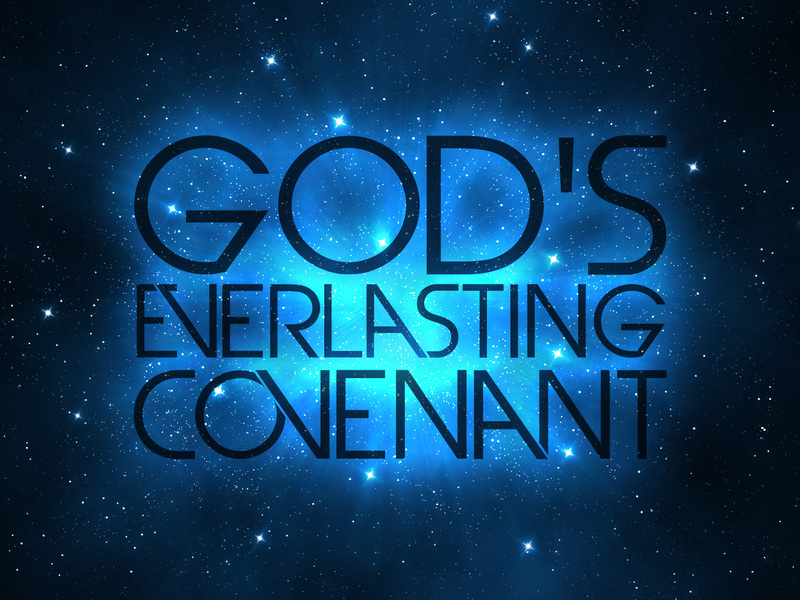 7 The LORD, the God of heaven, who took me from my father’s house and from the land of my birth, and who spoke to me and swore to me, ‘To your offspring I will give this land,’ he will send his angel before you, and you shall take a wife for my son from there. 9 So the servant put his hand under the thigh of Abraham his master and swore him concerning this matter. 10 Then the servant took ten of his master’s camels and departed, taking all kinds of choice gifts from his master; and he set out and went to Aram-naharaim, to the city of Nahor. 12 And he said, “O LORD, God of my master Abraham, please grant me success today and show steadfast love to my master Abraham. 13 I am standing here by the spring of water, and the daughters of the townspeople are coming out to draw water. 15 Before he had finished speaking, there was Rebekah, who was born to Bethuel son of Milcah, the wife of Nahor, Abraham’s brother, coming out with her water jar on her shoulder. 16 The girl was very fair to look upon, a virgin, whom no man had known. She went down to the spring, filled her jar, and came up. 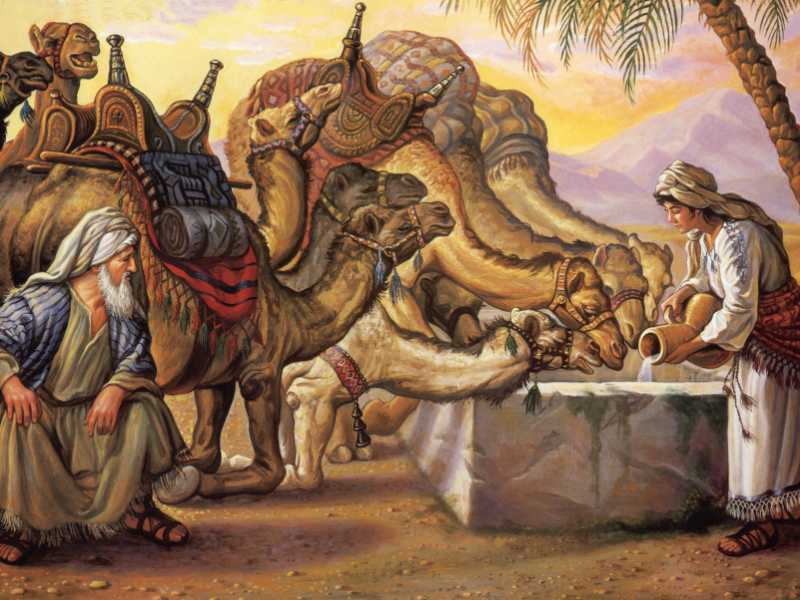 20 So she quickly emptied her jar into the trough and ran again to the well to draw, and she drew for all his camels. 21 The man gazed at her in silence to learn whether or not the LORD had made his journey successful. 28 Then the girl ran and told her mother’s household about these things. 29 Rebekah had a brother whose name was Laban; and Laban ran out to the man, to the spring. 30 As soon as he had seen the nosering, and the bracelets on his sister’s arms, and when he heard the words of his sister Rebekah, “Thus the man spoke to me,” he went to the man; and there he was, standing by the camels at the spring. 32 So the man came into the house; and Laban unloaded the camels, and gave him straw and fodder for the camels, and water to wash his feet and the feet of the men who were with him. 34 So he said, “I am Abraham’s servant. 35 The LORD has greatly blessed my master, and he has become wealthy; he has given him flocks and herds, silver and gold, male and female slaves, camels and donkeys. 36 And Sarah my master’s wife bore a son to my master when she was old; and he has given him all that he has. 40 But he said to me, ‘The LORD, before whom I walk, will send his angel with you and make your way successful. You shall get a wife for my son from my kindred, from my father’s house. 42 “I came today to the spring, and said, ‘O LORD, the God of my master Abraham, if now you will only make successful the way I am going! 46 She quickly let down her jar from her shoulder, and said, ‘Drink, and I will also water your camels.’ So I drank, and she also watered the camels. 47 Then I asked her, ‘Whose daughter are you?’ She said, ‘The daughter of Bethuel, Nahor’s son, whom Milcah bore to him.’ So I put the ring on her nose, and the bracelets on her arms. 50 Then Laban and Bethuel answered, “The thing comes from the LORD; we cannot speak to you anything bad or good. 52 When Abraham’s servant heard their words, he bowed himself to the ground before the LORD. 53 And the servant brought out jewelry of silver and of gold, and garments, and gave them to Rebekah; he also gave to her brother and to her mother costly ornaments. 59 So they sent away their sister Rebekah and her nurse along with Abraham’s servant and his men. 62 Now Isaac had come from Beer-lahai-roi, and was settled in the Negeb. 63 Isaac went out in the evening to walk in the field; and looking up, he saw camels coming. 65 and said to the servant, “Who is the man over there, walking in the field to meet us?” The servant said, “It is my master.” So she took her veil and covered herself. 67 Then Isaac brought her into his mother Sarah’s tent. He took Rebekah, and she became his wife; and he loved her. So Isaac was comforted after his mother’s death.